Check out the official poster for their upcoming action-thriller Haywire starring famous mixed martial arts (MMA) superstar Gina Carano as Mallory Kane, who performs her own high-adrenaline stunts. The Relativity Media film also stars Channing Tatum, Ewan McGregor, Michael Fassbender, Antonio Banderas, Bill Paxton, Michael Douglas and Michael Angarano. 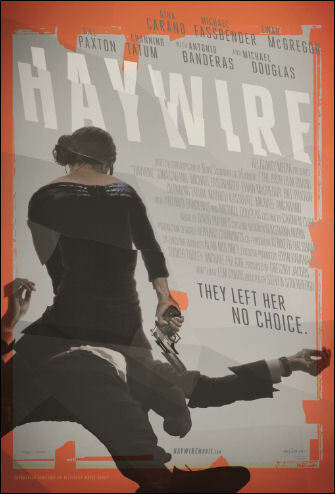 Haywire is directed by Steven Soderbergh and will be out in theaters on January 20, 2012.